NASA's Curiosity Mars rover has driven within robotic-arm's reach of the sandstone slab at the center of this April 23 view from the rover's Mast Camera. The rover team plans to have Curiosity examine a target patch on the rock, called "Windjana," to aid a decision about whether to drill there. NASA's Mars rover Curiosity may be about to drill into its third Red Planet rock. The 1-ton Curiosity rover has spent the past few days studying a Martian sandstone slab, assessing whether or not to break out its drill and collect samples from the rock's interior. Curiosity has drilled into two rocks since landing inside Mars' Gale Crater in August 2012 to determine if the Red Planet has ever been capable of supporting life. 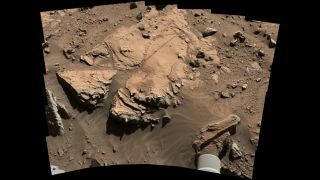 "We want to learn more about the wet process that turned sand deposits into sandstone here," Curiosity project scientist John Grotzinger, of the California Institute of Technology in Pasadena, said in a statement. "What was the composition of the fluids that bound the grains together? That aqueous chemistry is part of the habitability story we're investigating." Drilling into the Mars rock — dubbed "Windjana" after a canyon in Western Australia — could also reveal why some sandstones in the area are harder than others, helping scientists better understand the broad contours of Gale Crater, NASA officials said. The Mars rover Curiosity began investigating Windjana with its cameras and the X-ray spectrometer at the end of the rover's 7-foot-long (2.1 meters) robotic arm over the weekend, officials said. The six-wheeled robot has also fired lasers at Windjana with its ChemCam instrument to take detailed readings of the slab's composition. If the mission team decides to drill into Windjana, Curiosity will collect samples from about 2.5 inches (6.4 centimeters) deep. This powder will be delivered to various instruments on the rover's body for analysis. This image from the Navigation Camera on NASA's Curiosity Mars rover shows a sandstone slab on which the rover team has selected a target, "Windjana," for close-up examination. The target is on the approximately 2-foot-wide rock seen in the right half of this April 23, 2014, view. The first two rocks that Curiosity studied in this way were fine-grained mudstones in an area near the rover's landing site called Yellowknife Bay. Analysis of those samples revealed that Yellowknife Bay was a lake-and-stream system capable of supporting microbial life billions of years ago. Windjana is about 2.5 miles (4 km) from Yellowknife Bay, on the way to the towering Mount Sharp, which rises more than 3 miles (5 km) into the Martian sky from Gale Crater's center. Mount Sharp has long been Curiosity's ultimate science destination; the mission team wants Curiosity to climb up through the mountain's foothills, reading a history of Mars' changing environmental conditions as it goes. Curiosity set out for the base of Mount Sharp last July and should get there around the middle of this year, NASA officials have said.